Work With The Best! Meet the Ask Gina & Company Team! So you find yourself moving to a new city and don’t know who to trust to help you make the biggest investment of your life – your home. Or, your friend is moving and is relying on you to provide them with a top notch Realtor who will look out for their best interests, the way you would as their friend. These are scenarios encountered on a daily basis, and often ones that leave you searching for answers. In those uncertain times, how do you select the best real estate professional to guide you to home sweet home? You look for someone with a track record and the facts to back it up. Let me introduce myself. My name is Gina Tufano and I have been your Loudoun County Real Estate expert for over 16 years. In that time, I have been a Northern Virginia Association of Realtors (NVAR) Top Producer every year since 1998 and I have earned several important career designations, including: Certified Distressed Property Expert (CDPE), Short Sale and Foreclosure Resource (SFR), Accredited Staging Professional (ASP), Senior Real Estate Specialist (SRES), Real Estate Technology professional (ePRO), and the forward thinking GREEN designation. In addition, I have sold millions of dollars of real estate, allowing my clients to move up or move on in record time. While accumulating a successful track record in Loudoun County Real Estate, I have also assembled a fabulous team to help you reach your real estate goals. Meet the Ask Gina & Company team! As our senior buyer specialist, Jennifer Warner utilizes her degree in Marketing and her vast local knowledge to assist buyers in selecting the perfect place to hang their hats. Not only does Jennifer bring a refreshing, upbeat attitude each and every day, she is well qualified as a Certified Distressed Property Expert (CDPE) and the #1 team agent at Keller Williams Realty Loudoun Gateway! Up next is our marketing guru, Shannon Milligan. With a degree in Communications and an emphasis on Public Relations, Shannon works diligently to make sure your home is the talk of the town. Taking advantage of social media, blogging, and other strategic marketing channels, no stone is left unturned in order to get your home sold FAST and for TOP DOLLAR! At the helm of our team is the heart of any business – the office manager- Alana Sharp! As a graduate from Wright State University, Alana brings a keen eye and attention to detail to her main goal of ensuring a smooth transaction from contract to close and is often the first point of contact for client relations. Rounding out our awesome team is the entire Keller Williams Realty network of professionals. You see, at Keller Williams the philosophy is Win-Win. When one agent or team is successful, the entire office prospers. You know what they say, two heads are better than one! Working on that theory, we all strive to push one another to be at the top of our game and that means you, as our client, always come out a winner! 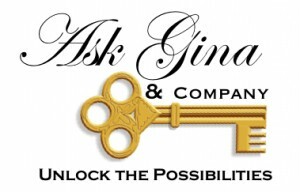 Want to know more about Ask Gina & Company? Check us out – we are everywhere! Ask Gina & Company thanks all of our clients, present and past, for their continued business. And, as always, we are grateful for your referrals of friends and family!